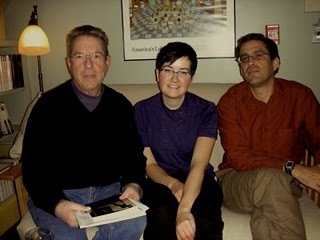 At right, left to right, PoemTalkers Tom Mandel, Sarah Dowling, Rodrigo Toscano. Bob Perelman began to write “The Unruly Child” using as a pattern Cesar Vallejo’s “The Right Meaning”. Vallejo: “Mother, you know there is a place somewhere called Paris. It’s a huge place and a long way off and it really is huge.” The Peruvian’s own mother had been dead many years at the time her son wrote the prose-poem, and it is a sad call back from late 1930s Paris (with all its politics, both fascist and antifascist — a tense scene in which Vallejo participated) to a lost Peruvian motherness — pre-self-exilic, pre-political. Tom Mandel, a second-time PoemTalker and an old colleague of Perelman, wanted (at least at first) to stave off theoretically sophisticated readings and to talk of the poem’s speaker as Perelman himself: Bob the witty talented impatient poet, Bob the literally unruly son. In its late-70s/early-80s political context, the poem risked being deemed mere bourgeoisified radicalism; but on second much-later thought, it seems to succeed in tracing the deformed social development of the political son of the American mother who learns the language by refusing to learn its “right” meaning. Bob Perelman, "The Unruly Child"
Bob Perelman began to write "The Unruly Child" using as a pattern Cesar Vallejo's "The Right Meaning". Vallejo: "Mother, you know there is a place somewhere called Paris. It's a huge place and a long way off and it really is huge." The Peruvian's own mother had been dead many years at the time her son wrote the prose-poem, and it is a sad call back from late 1930s Paris (with all its politics, both fascist and antifascist--a tense scene in which Vallejo participated) to a lost Peruvian motherness - pre-self-exilic, pre-political. The gesture creates a distance and a desperate emotion at once. "I want both modes of address to resonate," Perelman wrote to us at PoemTalk before our discussion. "Vallejo's heartfelt/estranged address to his mother is further estranged by my detourned quoting, but it's heartfelt, too. Kind of a chiastic structure: heartfelt/estranged: estranged/heartfelt." Tom Mandel, a second-time PoemTalker and an old colleague of Perelman, wanted (at least at first) to stave off theoretically sophisticated readings and to talk of the poem's speaker as Perelman himself: Bob the witty talented impatient poet, Bob the literally unruly son. In its late-70s/early-80s political context, the poem risked being deemed mere bourgeoisified radicalism; but on second much-later thought, it seems to succeed in tracing the deformed social development of the political son of the American mother who learns the language by refusing to learn its "right" meaning. 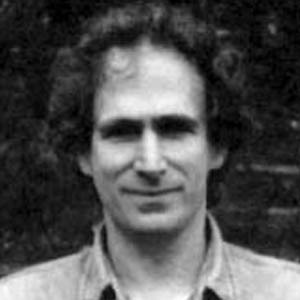 "The Unruly Child" was published in To the Reader (1984), an early Perelman book, and then reprinted in Ten to One, his book of selected poems. 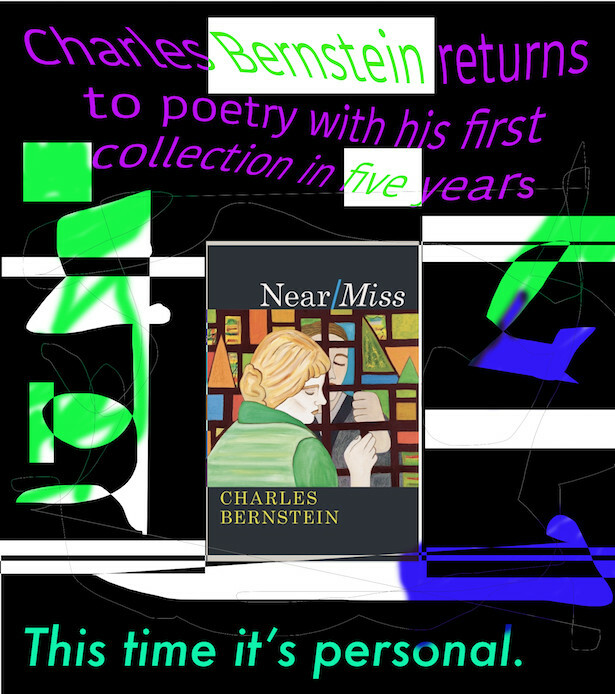 He recorded this poem for PennSound's Studio 111 series in 2004, offering a brief comment on each poem recited. 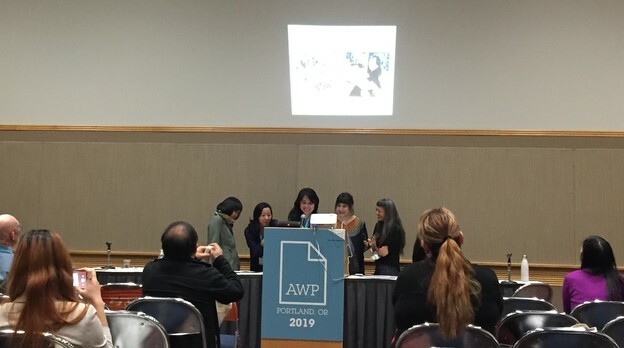 Before reading our poem, he mentions that To the Reader was the first book in which he regularly "used the present political landscape for subject matter." It is one poem in a series Hejinian has been writing, a project she currently calls The Book of a Thousand Eyes. If it is finished (perhaps, she tells us, in the summer of 2009? ), it might consist of 1,000 poems; more likely of 310 or a few more of them (the number she had completed at the time this episode was recorded). Some poems in the series appeared in The Little Book of a Thousand Eyes, published by Smoke-Proof Press — although, please note, our poem, “constant change figures,” does not appear in that gathering. 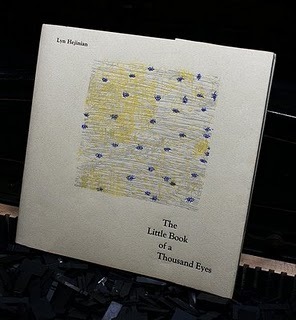 When Hejinian visited the Writers House a few years ago, she read 19 of these gorgeous little eyes, including ours. And it‘s the audio recording made during that reading that we use in our show. To what extent does our notion of nature’s picture — a picture of the many things we name “out there” — surprass the things we already know? We seem to deem memory nature’s picture. So to what extent is experience the result of our living in time, a state producing senses that are familiar and yet move us forward toward new and different effects? So, truly, constant change figures the time we sense. “Figures” there — a transitive verb at that point — enacts things: change makes things, shapes them, renders them, gets things just so. As you can tell from the recording, we were astonished that these words could accomplish all that thinking about words? Can you imagine writing a poem of nine triads, 27 lines in all, each line this carefully rendered — a poem that in all uses far fewer unique words than the total number of words in the poem, far fewer than conventional utterances would need to employ. Fewer, let’s say, than required by the language of philosophy telling of the same phenomena. During our lively Hejinian PoemTalk, Tom Mandel in particular works out for us the way the shifting yet repeating triads are enacted. 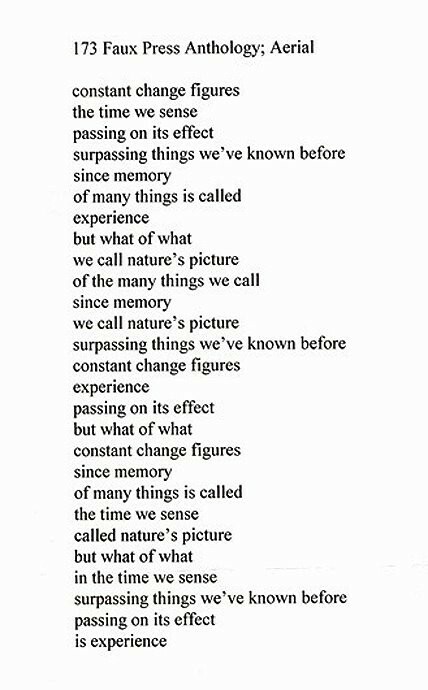 Bob Perelman focuses on Steinian memory (forgetting something himself along the way), Thomas Devaney on the power of turned-every-which-way phrasal variations, Al Filreis on the Steinian mode (again) and the poem as a possible critique of the ideology of experience. Lyn Hejinian, "constant change figures"
Above is Lyn Hejinian's typescript of an untitled poem we've taken to calling "constant change figures." To what extent does our notion of nature's picture--a picture of the many things we name "out there--surprass the things we already know? We seem to deem memory nature's picture. So to what extent is experience the result of our living in time, a state producing senses that are familiar and yet move us forward toward new and different effects?